On this night 71 years ago, Orson Welles and the Mercury Theatre on the Air shook the world with their 60-minute Halloween-themed radio adaptation of H.G. Wells' classic novel The War of the Worlds. At the time, the documetary-style broadcast captured the imagination of listeners and created mass panic and alarm. To this day, the broadcast remains an unparalleled masterpiece of science fiction horror. I've repeatedly listened to (and, in my classes, taught) this program over the years, and it remains a great favorite of mine. I find it also takes on new meaning in different contexts, as our experiences and world events change. Truly chilling listening. "In the 39th year of the twentieth century came the Great Disillusionment..."
* Download the complete broadcast at The Mercury Theatre on the Air website. * Read "The War of the Worlds Radio Broadcast: The Historical Perspective." 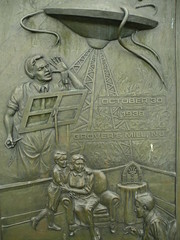 * See the website for the 1938 Martian Landing Monument at Grovers Mill, New Jersey. Spooky Text of the Day: Today's text is the original script from the The Mercury Theatre on the Air, The War of the Worlds, October 30, 1938. OPERATOR FOUR: 2X2L calling CQ . . . 2X2L calling CQ . . . 2X2L calling CQ . . . New York. Isn't there anyone on the air? Isn't there anyone on the air? Isn't there . . . anyone . . .? Ironic, isn't it? The mythical fleeing victims ---and the real ones. And the folks of the time period were more scared of the mythical... at least on that day. Great catch. I think that context left a lasting mark on the work, too, which is a reason it continues to speak to us. The entire sequence between Piersen and the Stranger, for example, is a chilling study. The Stranger's desire to "bring everybody down to their knees," to "own the world," has nothing to do with Martians, and everything to do with with the real, human monsters. Yes, I teach it too. And if you play the report of the Hindenburg fire along with it, it's difficult to tell the difference between real and fake reports of the time period. I've been interested to see how the fictional reporting resonate differently wit students since 9/11 and Katrina, too - fascinating stuff. For more OTR goodness, why not try out this episode of Quiet, Please entitled The Thing on the Fourble Board? And have some zombie-blasting fun with All Hallow's Eve. Oooh, yummy stuff! Thank you! :::giggle::: Thanks creepy twin for posting the links I didn't think to. ;-) I've got a lot of reading to do - I was busy working my way through screen and audio, but not Googling for articles... I suspect it would take *years* to read everything that's been said about it.